Earlier this month a decision was made by the Select Board to launch the new official town website at www.Longmeadow.org recognizing that there were still significant shortcomings. Here is short video clip of this SB discussion (courtesy of LCTV). This new redesigned website is a big disappointment for town residents given the missing and/or outdated information, bad links, etc. Only within the last week has outdated information been removed from the homepage and more timely news added. At this point the town website's functionality and usefulness are significantly less than that for the pre-July 2010 time period. Where is the School Building Committee's new HS project cost information (bid information + Guaranteed Maximum Price) obtained earlier this month? It was posted here on the Longmeadow Buzz blog (New High School Project Bids) but not posted on the "new" town website . During the past 10 months I benchmarked and posted here on the Buzz blog what other towns have done to develop and maintain their websites (including some cost estimates) but my suggestions and recommendations were not followed by the Website Task Force. Where is the new Longmeadow website? The Select Board's decision this month to re-establish the previously dissolved Website Task Force and ask it to develop a set of policy guidelines as to who can post what on the town website indicates we are still a long time away from having an effective town website. I would think that Kevin Warenda- Longmeadow's new Director of Technology (Schools + Town Government) and his IT group should have the primary responsibility for developing and maintaining the town website including the policy decisions about posting guidelines but this does not appear to be the case. Comments by Ms. Swanson and Ms. Crosbie at the end of the above SB discussion are somewhat encouraging when they asked about the Select Board commitment of additional $$$ resources to improve the website from its current state. Hopefully, IT related support for the town website does not take on the same complexion as the long standing school/ town government maintenance issue. I encourage town residents to send their comments about the need to improve our town website to all Select Board members. Vivian Maxine (Pickering) Henschke, 109, of Longmeadow, died on May 26, 2011 at the Julian J. Leavitt Jewish Nursing Home in Longmeadow, MA. Read the full obituary in the Springfield Republican. 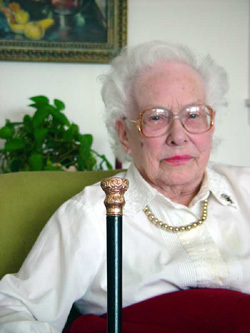 On January 23rd, 2003, Vivian Henschke was presented the Longmeadow Gold Cane as the town’s oldest citizen. In a tradition that dates back to 1909, Selectman Gerard Nolet presented Mrs. Henschke with the cane, with Rep. Mary Rogeness in attendance. Bob Lezinski wrote an excellent article (click to read) about Ms. Henschke for the Longmeadow Chronicles- a feature originally found on the town website but now the archives have been relocated to the new town website at www.LongmeadowMA.org.